↑ "Drugs that physically interact with Peroxisome proliferator-activated receptor alpha view/edit references on wikidata". ↑ Sher T, Yi HF, McBride OW, Gonzalez FJ (June 1993). "cDNA cloning, chromosomal mapping, and functional characterization of the human peroxisome proliferator activated receptor". Biochemistry. 32 (21): 5598–604. doi:10.1021/bi00072a015. PMID 7684926. ↑ Issemann I, Green S (October 1990). "Activation of a member of the steroid hormone receptor superfamily by peroxisome proliferators.". Nature. 347 (6294): 645–54. doi:10.1038/347645a0. PMID 2129546. 1 2 Kersten S, Seydoux J, Peters JM, Gonzalez FJ, Desvergne B, Wahli W (June 1999). "Peroxisome proliferator-activated receptor alpha mediates the adaptive response to fasting.". J Clin Invest. 103 (11): 1489–98. doi:10.1172/JCI6223. PMC 408372 . PMID 10359558. 1 2 Kersten S (2014). "Integrated physiology and systems biology of PPARα.". Molecular Metabolism. 3: 354–371. doi:10.1016/j.molmet.2014.02.002. PMC 4060217 . PMID 24944896. ↑ Braissant O, Foufelle F, Scotto C, Dauça M, Wahli W (January 1995). "Differential expression of peroxisome proliferator-activated receptors (PPARs): tissue distribution of PPAR-alpha, -beta, and -gamma in the adult rat.". Endocrinology. 137 (1): 354–66. doi:10.1210/endo.137.1.8536636. PMID 8536636. ↑ Lee SS, Pineau T, Drago J, Lee EJ, Owens JW, Kroetz DL, Fernandez-Salguero PM, Westphal H, Gonzalez FJ (June 1995). "Targeted disruption of the alpha isoform of the peroxisome proliferator-activated receptor gene in mice results in abolishment of the pleiotropic effects of peroxisome proliferators.". Mol Cell Biol. 15 (6): 3012–22. PMC 230532 . PMID 7539101. ↑ Staels B, Maes M, Zambon A (September 2008). "Peroxisome Fibrates and future PPARα agonists in the treatment of cardiovascular disease.". Nat Clin Pract Cardiovasc Med. 5 (9): 542–53. doi:10.1038/ncpcardio1278. PMID 18628776. ↑ Puligheddu M, Pillolla G, Melis M, Lecca S, Marrosu F, De Montis MG, Scheggi S, Carta G, Murru E, Aroni S, Muntoni AL, Pistis M (2013). "PPAR-alpha agonists as novel antiepileptic drugs: preclinical findings.". PLoS ONE. 8 (5): e64541. doi:10.1371/journal.pone.0064541. PMC 3664607 . PMID 23724059. ↑ Citraro R, Russo E, Scicchitano F, van Rijn CM, Cosco D, Avagliano C, Russo R, D'Agostino G, Petrosino S, Guida F, Gatta L, van Luijtelaar G, Maione S, Di Marzo V, Calignano A, De Sarro G (2013). "Antiepileptic action of N-palmitoylethanolamine through CB1 and PPAR-α receptor activation in a genetic model of absence epilepsy.". Neuropharmacology. 69: 115–26. doi:10.1016/j.neuropharm.2012.11.017. PMID 23206503. 1 2 Sumanasekera WK, Tien ES, Turpey R, Vanden Heuvel JP, Perdew GH (February 2003). "Evidence that peroxisome proliferator-activated receptor alpha is complexed with the 90-kDa heat shock protein and the hepatitis virus B X-associated protein 2". J. Biol. Chem. 278 (7): 4467–73. doi:10.1074/jbc.M211261200. PMID 12482853. 1 2 Dowell P, Ishmael JE, Avram D, Peterson VJ, Nevrivy DJ, Leid M (December 1997). "p300 functions as a coactivator for the peroxisome proliferator-activated receptor alpha". J. Biol. Chem. 272 (52): 33435–43. doi:10.1074/jbc.272.52.33435. PMID 9407140. 1 2 Dowell P, Ishmael JE, Avram D, Peterson VJ, Nevrivy DJ, Leid M (May 1999). "Identification of nuclear receptor corepressor as a peroxisome proliferator-activated receptor alpha interacting protein". J. Biol. Chem. 274 (22): 15901–7. doi:10.1074/jbc.274.22.15901. PMID 10336495. ↑ Treuter E, Albrektsen T, Johansson L, Leers J, Gustafsson JA (June 1998). "A regulatory role for RIP140 in nuclear receptor activation". Mol. Endocrinol. 12 (6): 864–81. doi:10.1210/mend.12.6.0123. PMID 9626662. Rakhshandehroo M, Hooiveld G, Müller M, Kersten S (2009). "Comparative analysis of gene regulation by the transcription factor PPARalpha between mouse and human.". PLoS ONE. 4: e6796. doi:10.1371/journal.pone.0006796. PMC 2729378 . PMID 19710929. Berger J, Moller DE (2002). "The mechanisms of action of PPARs.". Annu. Rev. Med. 53: 409–35. doi:10.1146/annurev.med.53.082901.104018. PMID 11818483. Kuenzli S, Saurat JH (2003). "Peroxisome proliferator-activated receptors in cutaneous biology.". Br. J. Dermatol. 149 (2): 229–36. doi:10.1046/j.1365-2133.2003.05532.x. PMID 12932225. Mandard S, Müller M, Kersten S (2004). 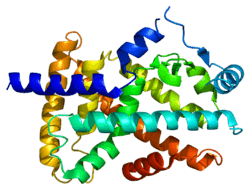 "Peroxisome proliferator-activated receptor alpha target genes.". Cell. Mol. Life Sci. 61 (4): 393–416. doi:10.1007/s00018-003-3216-3. PMID 14999402.
van Raalte DH, Li M, Pritchard PH, Wasan KM (2005). "Peroxisome proliferator-activated receptor (PPAR)-alpha: a pharmacological target with a promising future.". Pharm. Res. 21 (9): 1531–8. doi:10.1023/B:PHAM.0000041444.06122.8d. PMID 15497675. Lefebvre P, Chinetti G, Fruchart JC, Staels B (2006). 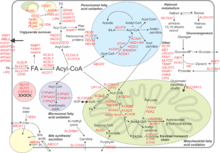 "Sorting out the roles of PPAR alpha in energy metabolism and vascular homeostasis.". J. Clin. Invest. 116 (3): 571–80. doi:10.1172/JCI27989. PMC 1386122 . PMID 16511589. Mukherjee R, Jow L, Noonan D, McDonnell DP (1995). "Human and rat peroxisome proliferator activated receptors (PPARs) demonstrate similar tissue distribution but different responsiveness to PPAR activators.". J. Steroid Biochem. Mol. Biol. 51 (3-4): 157–66. doi:10.1016/0960-0760(94)90089-2. PMID 7981125. Miyata KS, McCaw SE, Patel HV, Rachubinski RA, Capone JP (1996). "The orphan nuclear hormone receptor LXR alpha interacts with the peroxisome proliferator-activated receptor and inhibits peroxisome proliferator signaling.". J. Biol. Chem. 271 (16): 9189–92. doi:10.1074/jbc.271.16.9189. PMID 8621574. Chu R, Lin Y, Rao MS, Reddy JK (1996). "Cloning and identification of rat deoxyuridine triphosphatase as an inhibitor of peroxisome proliferator-activated receptor alpha.". J. Biol. Chem. 271 (44): 27670–6. doi:10.1074/jbc.271.44.27670. PMID 8910358. Tugwood JD, Aldridge TC, Lambe KG, Macdonald N, Woodyatt NJ (1997). "Peroxisome proliferator-activated receptors: structures and function.". Ann. N. Y. Acad. Sci. 804: 252–65. doi:10.1111/j.1749-6632.1996.tb18620.x. PMID 8993548. Li H, Gomes PJ, Chen JD (1997). "RAC3, a steroid/nuclear receptor-associated coactivator that is related to SRC-1 and TIF2.". Proc. Natl. Acad. Sci. U.S.A. 94 (16): 8479–84. doi:10.1073/pnas.94.16.8479. PMC 22964 . PMID 9238002. Dowell P, Ishmael JE, Avram D, Peterson VJ, Nevrivy DJ, Leid M (1998). "p300 functions as a coactivator for the peroxisome proliferator-activated receptor alpha.". J. Biol. Chem. 272 (52): 33435–43. doi:10.1074/jbc.272.52.33435. PMID 9407140. Inoue I, Shino K, Noji S, Awata T, Katayama S (1998). "Expression of peroxisome proliferator-activated receptor alpha (PPAR alpha) in primary cultures of human vascular endothelial cells.". Biochem. Biophys. Res. Commun. 246 (2): 370–4. doi:10.1006/bbrc.1998.8622. PMID 9610365. Treuter E, Albrektsen T, Johansson L, Leers J, Gustafsson JA (1998). "A regulatory role for RIP140 in nuclear receptor activation.". Mol. Endocrinol. 12 (6): 864–81. doi:10.1210/mend.12.6.0123. PMID 9626662. Rubino D, Driggers P, Arbit D, Kemp L, Miller B, Coso O, Pagliai K, Gray K, Gutkind S, Segars J (1998). "Characterization of Brx, a novel Dbl family member that modulates estrogen receptor action.". Oncogene. 16 (19): 2513–26. doi:10.1038/sj.onc.1201783. PMID 9627117. Yuan CX, Ito M, Fondell JD, Fu ZY, Roeder RG (1998). "The TRAP220 component of a thyroid hormone receptor- associated protein (TRAP) coactivator complex interacts directly with nuclear receptors in a ligand-dependent fashion.". Proc. Natl. Acad. Sci. U.S.A. 95 (14): 7939–44. doi:10.1073/pnas.95.14.7939. PMC 20908 . PMID 9653119. Chinetti G, Griglio S, Antonucci M, Torra IP, Delerive P, Majd Z, Fruchart JC, Chapman J, Najib J, Staels B (1998). "Activation of proliferator-activated receptors alpha and gamma induces apoptosis of human monocyte-derived macrophages.". J. Biol. Chem. 273 (40): 25573–80. doi:10.1074/jbc.273.40.25573. PMID 9748221. Costet P, Legendre C, Moré J, Edgar A, Galtier P, Pineau T (1998). "Peroxisome proliferator-activated receptor alpha-isoform deficiency leads to progressive dyslipidemia with sexually dimorphic obesity and steatosis.". J. Biol. Chem. 273 (45): 29577–85. doi:10.1074/jbc.273.45.29577. PMID 9792666. Masuda N, Yasumo H, Furusawa T, Tsukamoto T, Sadano H, Osumi T (1998). "Nuclear receptor binding factor-1 (NRBF-1), a protein interacting with a wide spectrum of nuclear hormone receptors.". Gene. 221 (2): 225–33. doi:10.1016/S0378-1119(98)00461-2. PMID 9795230. Rakhshandehroo M, Sanderson LM, Matilainen M, Stienstra R, Carlberg C, de Groot PJ, Müller M, Kersten S (2007). "Comprehensive analysis of PPARalpha-dependent regulation of hepatic lipid metabolism by expression profiling.". PPAR Res. 2007: 26839. doi:10.1155/2007/26839. PMID 18288265. 1k7l: The 2.5 Angstrom resolution crystal structure of the human PPARalpha ligand binding domain bound with GW409544 and a co-activator peptide.